Due to all the photographs I’m taking the world is slightly upset. Things move to the wrong place. 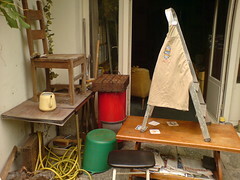 A chair on a table, a wooden beercrate on top of a heating, that same heating & also some tv-guides outside & a watercontainer upside down. That’s just what you get to see. I do see more. The only thing I can do is put them in a picture, together with a certain T. Maybe it will give them the feeling they will live forever. I know that feeling. I understand them.